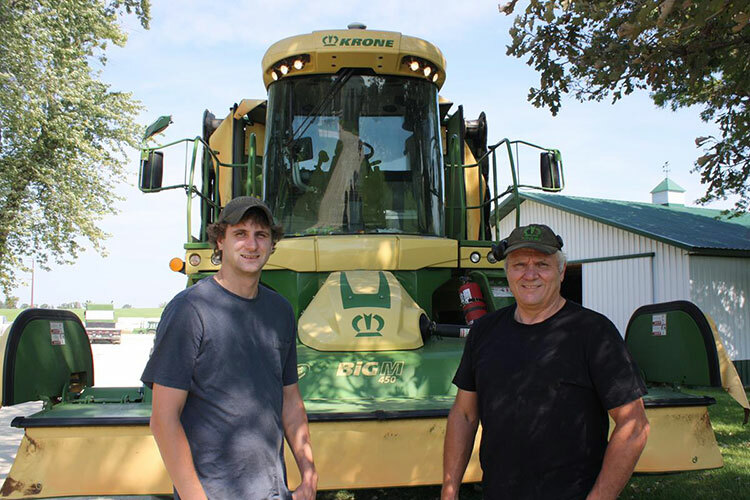 Ray Leffingwell and his son Miles, of Wanamingo, Minnesota, put the new BiG M 450 CR to the test this past year, mowing over 4,800 acres. For North American hay producers looking to maximize their return on investment, Krone is pleased to introduce the new BiG M 450 Self-Propelled Mower Conditioner. Krone unveiled the new BiG M 450 in Amarillo, Texas at the Custom Harvesters Annual Convention in January. The new BiG M 450 lets producers mow and condition more acres—faster and resulting in better quality hay—than ever before. That means hay growers can harvest a higher quality hay crop faster, and in doing so, beat tight weather windows. The new BiG M 450 CR model, featuring intermeshing chevron pattern rubber or steel conditioning M rolls, creates three equal-sized windrows for faster, uniform drydown. Cut 36’ 7” wide when choosing the BiG M 450 CR model, featuring intermeshing chevron pattern rubber or steel conditioning M rolls. Cut 32’ 6” wide when choosing the BiG M 450 CV model, featuring V-tines. Harvest the crop sooner. The BiG M 450 CR model creates three equal-sized windrows for faster, uniform drydown. Choose from several swath formation options. Match rake widths, and merge all crops into one windrow for chopping, or lay the hay out wide for fast drydown and baling. Mow at speeds up to 15.5 mph. Stepless Bosch Drive System creates a smoother ride with no shift points, reducing fuel consumption. New traction control system further improves performance. Save money on fuel. Get excellent fuel efficiency from the 449-hp Liebherr Tier 4 Final engines, featuring EcoPower. Engine access has been improved for easy servicing. Heavy-duty Krone cutterbars with SafeCut disk protection. Proven, heavy-duty, exclusive Krone cutterbars feature improved obstacle protection and Quick-Change blades for quick replacement. Quieter cab means increased operator comfort and productivity. Spacious cab design improves visibility, and comes with ergonomic controls, “living-room” comforts, and 10” touch screen display for simplified and advanced diagnostics. Quick travel between fields further increases productivity. Wings fold up quickly to just 9’10” wide transport width, then the operator can travel roads at speeds up to 25 miles per hour. Ray Leffingwell and son Miles, who operate a diversified haying business in southeast Minnesota, cut over 4,800 acres with the new BiG M 450 with rubber conditioning rollers during this past 2018 haying season. Click here to see the new BiG M 450 video, and hear additional comments from the Leffingwells of Wanamingo, Minnesota. About Krone North America: Krone is a 113-year old, family-owned and operated business based in Spelle, Germany. 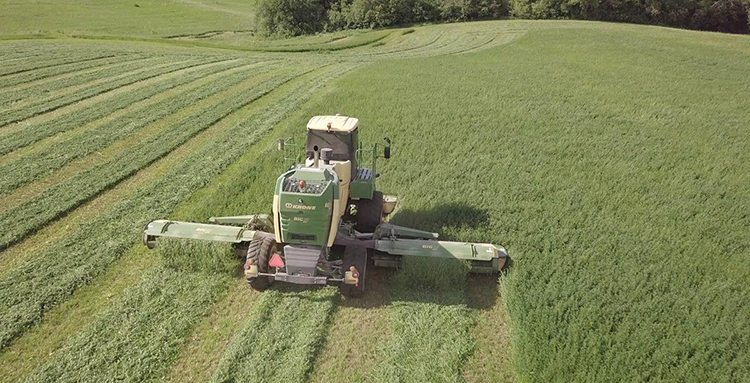 Our North American division—Krone NA—has been providing customers with premium-quality, cutting edge™ hay and forage equipment for more than 46 years, equipment that is German-engineered for North American fields. For more information, visit krone-na.com.